36 in. 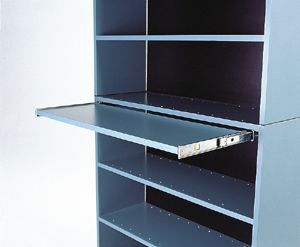 wide Pull Out Shelf for Ancom Series 2000 Open Shelf Cabinet. Add a convenient work surface to your filing area. Strong 3/4 in. wood shelf can be installed on any Ancom Open Shelf cabinet. Equipped with fully progressive slides. Adds 1.5 in. to height of cabinet.